Matt Pope leaps over Dundee net minder Pontus Sjogren. Pic: Richard Murray. Cardiff Devils let themselves down at the Viola Arena in Cardiff Bay. For the second successive home match they failed against opposition they should have beaten. They went down 3-2 against Dundee Stars, after sudden death overtime and penalties, having lost by the same scoreline against MK Lightning in their last home fixture. 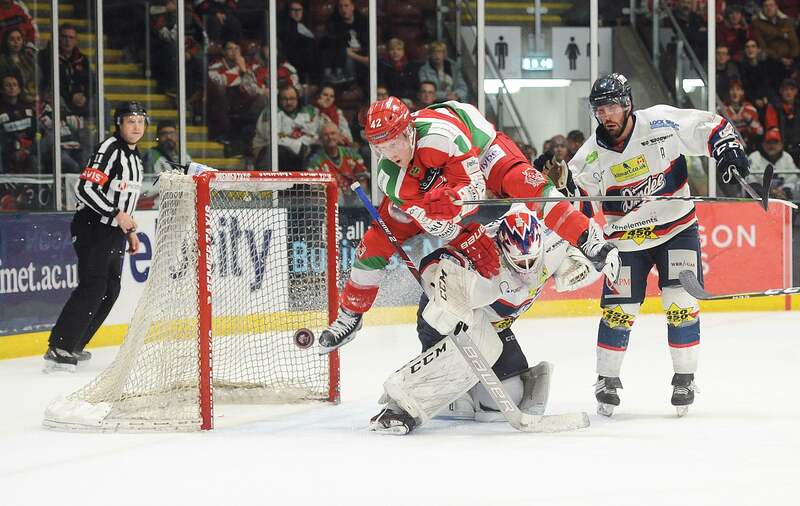 Devils are intent on winning a third successive Elite League title, but losing against the League’s bottom two teams certainly doesn’t suggest they can achieve the treble. If Devils win their games in hand they will go top after Belfast Giants lost 4-2 against Sheffield Steelers, but they really should have crushed Stars. Cardiff trio Matt Pope, Sean Bentivoglio and Mark Louis celebrate. Pic: Richard Murray. They dominated the first period and failed to make Stars pay. It was the same story in the second. The match officials played their part, ruling out a Mike Hedden effort for high stick sat a time when that would have made it 3-0, but there is no question Devils let themselves down. They lack a killer instinct. Head coach Andrew Lord shortened his bench and went with two lines when the game was in the balance. For me, he has to trust in his team and run three, maybe four lines, whenever possible. Going with two means the high end players are exhausted and their teammates sitting out have to be fed up. There has to be a balance. Lord was clearly frustrated by the officials, making his points loudly and emphatically at times, and there were times when he was spot on. Mike Hedden helps clear the teddy bears in Devils’ annual ‘Air the Bear’ promotion. Pic: Richard Murray. When Sean Bentivoglio powered away from the Dundee D-men he was dragged down firm behind. No penalty was awarded and the officials signalled a hip check. That looked almost impossible when Benti was bearing down on goal and the defenceman was behind him. Dundee launched a third period comeback from 2-0 down to force the game into overtime and left home fans shocked. After leading 2-0 going into the final period, Lord will be disappointed by the overtime loss. Devils outshot Stars 11-8 in the opening period, but could only score once past Pontus Sjogren in the Dundee net. Charles Linglet tries to jam the puck past the Dundee netminder Pontus Sjogren. Pic: Richard Murray. That goal came at 13-17 when Matt Pope tipped in a shot from Mark Louis to put the home side up 1-0. Devils outshot the Stars again in the middle period, this time 14-10, and again found the net at 34:36 when Bentivoglio tucked in a loose puck after a cannon from Pope was initially stopped by Sjogren to make it 2-0. Stars battled back, scoring at 45-44 courtesy of Johan Andersson. Then, with just under five minutes to play, Stars tied the game when Drydn Dow’s slapshot beat goalie Ben Bowns to make it 2-2. Stars claimed a third goal on the next shift, but after an extensive review the effort was ruled out. During overtime Devils controlled the play, but man of the match Sjogren kept the puck out. Both teams scored twice in the first round of five shooters, but in sudden death shots Matt Marquardt scored for a second time in the shootout to give Stars the win. The next match for Devils is against Guildford Flames at home on Wednesday (7.30pm). Scorers, Devils: Matt Pope 1+1, Sean Bentivoglio 1+1, Mark Louis 0+1, Evan Mosey 0+1. Stars: Johan Andersson 1+0, Drydn Dow 1+0, Matt Marquardt 0+1, Mike Bissonette 0+1, Charles Corcoran 0+1. Period scores (Devils first): 1-0; 1-0 (2-0); 0-2 (2-3); 0-0 (2-2). Penalties in minutes: Devils 2+2+0=4; Stars 0+2+2=4. Shots on goal: Devils (on Sjogren) 11+14+9+3=37; Stars (on Bowns) 8+10+14+2=35. Special teams: Devils PK 2/2, PP 0/2; Stars 2/2, PP 0/2. Referees: Matt Rose, Matt Thompson. Stars of the game: Devils, Sean Bentivoglio; Stars, Pontus Sjogren. Cardiff Devils coach Andrew Lord. Sunday results in Elite League: Nottingham Panthers 7, Glasgow Clan 2; Sheffield Steelers 4, Belfast Giants 2; Coventry Blaze 5, Guildford Flames 6; Manchester Storm 3, Fife Flyers 4; Cardiff Devils 2, Dundee Stars 3 (after overtime and penalties). Panthers made it five wins in a row. Guillaume Lepine’s shorthanded goal with less than three minutes played put the Panthers on their way to the win, with Alex Guptill and Tyler Biggs (also shorthanded) putting the home side three up by 12-11. Zach Fitzgerald pulled one back for the Clan with 2-27 left on the period before Panthers hit a quickfire double in the middle session to move further ahead. Justin Kovacs and Mark Hurtubise scored 1-04 apart, both on the powerplay, to make it 5-1. Farmer added Panthers’ sixth goal, a third shorthanded strike (33-49). Scott Pitt doubled the Clan’s total on 44-33 into the final period, but Guptill added another at 53-35 to round off a 7-2. Steelers were two goals up after 20 minutes thanks to Rob Dowd’s double. The hosts went three goals ahead when Josh McFadden found the net on 23-07 played and before the halfway mark had raced into a four-goal lead thanks to Ben O’Connor. Francis Beauvillier pulled one back, while Blair Riley added Giants’ second with less than a minute left. Three goals in 43 seconds helped Flames come back from 5-2 down to tie the game at Coventry. Blaze led by two after 20 minutes thanks to goals from Shawn Pauly and Tim Crowder, both inside the last 90 seconds of the period. When Jake Hansen put the Blaze three up at 24:27, and then Ben Lake made it 4-0 just over a minute later, the Blaze looked to be on their way to a comfortable win. John Dunbar pulled one back from the Flames at 28:58, while Ian Watters then made it a two-goal game at 31:16. Despite conceding two in a row, the Blaze re-established a three-goal lead with 47:27 played through Lake, but the real drama was still to come. Watters finished from a tight angle to make it 5-3 at 58:17, Calle Ackered then reduced the arrears to one 16 seconds later. With 1:10 left in the game Watters again found the net to tie things up at five each. Overtime was end to end, eventually with TJ Foster coming in at the far post to slot home with 63:21 on the clock. A late comeback by Fife Flyers forced overtime in Manchester and the Scottish club won in overtime. It took just over two minutes for the deadlock to be broken in Manchester, Brett Bulmer putting Flyers ahead. Storm were level two minutes through, Marcus Basara put Fife ahead again on 15-49. Storm hit back thanks to an Evan Richardson goal with 1-56 left on the period. Chance Braid put Storm ahead for the first time in the game just over four minutes into the second period, and they held that lead until the closing stages. Fife rescued a point with the goalie pulled as Danick Gauthier beat Ginn with 50 seconds remaining in the game. That goal forced overtime which saw some decent chances for both teams, before Paul Crowder pounced on a rebound to Rick Pinkston’s shot to take the extra point for the Flyers.